BACKGROUND AND PURPOSE: Occasionally we have observed anecdotal cases of asymptomatic hyperintensities on diffusion-weighted MR (DW-MR) examinations of the brain of patients who previously underwent routine cerebral angiography. These observations, as well as MR imaging and transcranial Doppler data in the literature suggesting a high rate of procedure-associated emboli, raise concern regarding the underdiagnosis of asymptomatic focal infarction associated with cerebral angiography. In order to determine whether asymptomatic diffusion abnormalities are frequently associated with procedures, we prospectively obtained DW-MR images before and after routine cerebral angiography. METHODS: Twenty consecutive patients, who met protocol criteria and received a routine three- or four-vessel diagnostic cerebral angiogram at our institution, were evaluated. Using a Bayesian estimate to establish an upper bound for the incidence of an event with zero occurrences in a study sample, the study group size was selected to exclude a 10% incidence of abnormalities revealed by DW-MR imaging of patients who underwent previous cerebral angiography. Two neuroradiologists evaluated imaging studies. RESULTS: Neither clinical signs nor abnormalities on DW-MR images were found, which suggested no infarction after angiography in our patient sample. Based on this data, an upper bound of 9% (95% confidence) is predicted for the appearance of abnormalities revealed by DW-MR imaging after cerebral angiography. CONCLUSION: Cerebral angiography is associated with an incidence of asymptomatic cerebral infarction of no more than 9%. It well may be substantially lower than this estimate; a more accurate evaluation of the true incidence would require a significantly larger study population. This test provides a convenient noninvasive means of assessing procedure-related cerebral infarction, such as that which occurs after carotid endarterectomy or vascular angioplasty and stenting. Cerebral angiography is associated with a small but definite incidence of cerebral infarction. The reasons for these events are not defined completely, although several risk factors have been identified. In many cases, embolization of air, thrombus, or particulate matter, such as calcified plaque, is believed to be associated with the clinical event. It is not clear, however, whether the observed rate of infarction reflects the occurrence of rare symptomatic lesions or whether asymptomatic infarctions are a frequent undetected result of cerebral angiography. We have addressed this question by using diffusion-weighted MR (DW- MR) imaging to evaluate the incidence of diffusion abnormalities within the brain after angiography. The study protocol was reviewed and approved by the hospital institutional review board. Patients were recruited for a 6-month period from April to September 1998. Informed consent was obtained from each subject. The patient population included 20 consecutive neurologically intact adults between 25 and 80 years old, receiving a routine diagnostic cerebral angiogram, who did not meet the exclusion criteria appearing in Table 1. Medical risk factors within the study group included five patients with a history of systemic hypertension controlled with medication. One patient presented with a history of diabetes mellitus. Patients were initially assigned an NIH Stroke Scale (NIHSS) score by a neurology resident (in 14 of 20 cases) or a neuroradiology fellow (in six of 20 cases), trained to administer the NIHSS test (1). Each patient then underwent a DW-MR study according to the protocol described herein. Within 12 hours, a routine three- or four-vessel cerebral angiogram was performed. No sooner than 2 hours and no later than 12 hours after the angiogram was obtained, the patient underwent a postprocedural DW-MR study. Prior to discharge, the patient was examined again by a neurology resident (16 of 20 cases) or a neuroradiology fellow (four of 20 cases) and an NIHSS score was assessed. The average time between the baseline diffusion MR study and the angiogram was 2 hours, with a range of 0.5 to 8.5 hours. The average time from the completion of the angiogram to the second DW-MR study was 5.7 hours (range, 2.0 to 11.25 hours). All but four studies were performed at greater than 4 hours after angiography was performed. The indications for angiography are detailed in Table 2. The angiogram was performed using a single-plane digital-subtraction angiography methodology according to standard protocols in use at our institution. A neuroradiology fellow under the direct supervision of the attending neuroradiologist performed the study. The catheter time, number of catheters used, type of catheter required, number and type of guidewire used, number of vessels treated by catheterization, number of projections obtained, and the contrast load were recorded during the procedure. The mean time from groin puncture to catheter removal was 1.4 hours (range, 0.58–4.0 hours). A mean of 1.5 catheters (range, 1–4) was used with the 5.5F H1 catheter (Cook, Bloomington, IN) as the initial choice for all examinations. Other catheters from various manufacturers, including antegrade and retrograde (Simmon's configuration) catheters for selective catheterization as well as multihole (Pigtail configuration) catheters, were used in some cases. A mean of 1.6 guidewires (range, 1–3) was used, with the Bentson guidewire (Cook) routinely used initially. The Roadrunner (Cook) or an angled Glidewire (Meditech, Natick, MA) were guidewires of second choice. A mean of four vessels were selectively treated by catheterization (range, 3–6). Average total volume of nonionic contrast material (Omnipaque 300, Nycomed, Princeton, NJ) injected was 143 mL (range, 87–251 mL). A saline flush used during the procedure contained 2000 units of heparin in 500 mL of normal saline. Double-flush technique was used in all procedures, with periodic flushes performed at approximately 90-second intervals. Because each flush consisted of a 4-mL injection, approximately 16 units of heparin were administered per flush. This results in the administration of approximately 600 units per hour of heparin. In cases judged by the attending neuroradiologist to be difficult or prolonged, low-dose heparin was administered by slow intravenous push. A total of five patients, with an average age of 68 years (range, 58–78 years), received 1500 to 2000 units of heparin by this route during the procedure. Thus, these patients received a bolus administration in addition to the dosing associated with the periodic flush. The average length of these five examinations was 1.87 hours (range, 0.73–4.0 hours). This exceeded the average age of 55 years and the average examination length of 1.25 hours for patients who did not receive bolus heparin. No patients underwent systemic heparinization prior to the start of the procedure. A 5F sheath was placed in nine patients when the catheterization was felt likely to be difficult or in order to compensate for torque resistance at the puncture site. Many abnormalities were diagnosed, with a normal examination seen in eight of the angiograms (Table 3). All DW-MR studies were performed on a 1.5-T MR imaging system that included high-performance gradient subsystems (slew rate, 23 milliT/meter; peak amplitude, 2.7 gauss/cm; rise time, 192 μsec). A single-shot echo-planar spin-echo sequence (TE, 101 msec; receiver bandwidth,149 kHz) was used. Pixel dimensions were 2.5 mm2, with a slice thickness of 5 mm and a 2.5-mm interslice gap. Total scan time was 26 seconds. Diffusion-sensitized gradients (b = 0,1000 sec/mm2) were applied in each of three orthogonal directions (right-left, anteroposterior, and craniocaudal), and images from each of the three diffusion-sensitized acquisitions were displayed separately for analysis. Two neuroradiologists separately and blindly evaluated the pre- and postprocedural studies. Subsequently, the two readers compared pre- and postangiographic studies and a consensus opinion regarding changes was generated. The sample size for this trial was selected to allow a 10% incidence of diffusion abnormalities in asymptomatic patients to be excluded with 95% confidence. This determination was made using a Bayesian estimate with noninformative beta to establish an upper bound for the incidence of an event with zero occurrences in a study sample (2). A similar result can be obtained by applying classical methods (3). In 19 of 20 patients, the NIHSS score was initially 0 and remained 0 after the procedure. In the one remaining patient, the NIHSS score on initial evaluation was 3 owing to congenital deficits and remained 3 on the postprocedural evaluation, as determined by the neurology resident. No transient changes in neurologic status occurred in any patient during cerebral angiography. A total of 40 DW-MR studies were evaluated blindly. In every case, both readers diagnosed no abnormality. Subsequent comparison of pre- and postangiographic studies by the two readers resulted in a consensus opinion of no evidence of new abnormalities on DW-MR images after the procedure. With this data, using the statistical methods described in the Methods section, an upper bound of 9% for the incidence of abnormalities on DW-MR images in asymptomatic patients who underwent cerebral angiography can be assigned with 95% confidence. Cerebral angiography is associated with an approximate 0.5% incidence of persistent neurologic deficit, which, in most cases, is owing to cerebral infarction (4–6). Several risk factors, such as hypertension, atherosclerosis, diabetes, older age, long procedure times, and use of more than one catheter, have been associated with an increased incidence of infarction. Although occasionally severe vascular narrowing or occlusion from dissection or vasospasm may result in symptomatic flow restriction, most of the infarcts associated with angiography are likely from distal embolization of air or particulate matter (5). Limited data exist in the literature regarding the occurrence of MR abnormalities associated with cerebral angiography. In a short communication, Mamourian and Drayer (7) described five cases of abnormalities revealed by T2-weighted MR imaging performed within 24 hours of cerebral angiography. Gerraty et al (8) studied 24 patients with T2-weighted MR imaging performed both before and after cerebral angiography. The second imaging study was performed between 21 and 33 hours after the procedure. One patient became symptomatic during angiography, and subsequently a small lesion was identified within the thalamus. Of the remaining 23 patients who remained asymptomatic during and after angiography, none showed any new abnormalities on T2-weighted images. Several authors have described the presence of high-intensity transient spectral signals, sometimes termed microembolic signals, that are obtained from the middle cerebral artery by using transcranial Doppler sonography during cerebral or carotid angiography (8–11). A typical microembolic-signal count during the course of a cerebral angiogram ranges from 50–100. Most of these anomalies have spectral properties consistent with air emboli, although some are ascribed to solid material and likely are owing to thrombi or, in rare cases, solid plaque material. These emboli occur predominately during contrast or saline flush injection and are seen less commonly during catheter and wire manipulation. These data suggest that most of the detected emboli represent air bubbles introduced during contrast injection and saline flush. The clinical significance of such microembolization during angiography is controversial. Nonetheless, neuropsychological changes of patients undergoing cardiac valve replacement, during which much higher (on the order of 1000) microembolic signals were recorded throughout the procedure, have been documented (12). Coronary artery bypass graft procedures can be associated with small asymptomatic ischemic cerebral lesions detectable by MR imaging (13). Pathologic studies (14) have documented fatty intravascular collections, believed to be embolic in nature, associated with cardiopulmonary bypass. DW-MR imaging represents a new and sensitive probe for acute cerebral infarction (15). Data collected using echo-planar sequences with diffusion sensitization can be used to form anisotropic (orthogonal-axis) DW-MR maps. Isotropic representations can be derived from these data by generating trace images. Such DW-MR data incorporate the effects of the intended diffusion weighting as well as T2 effects—a phenomenon known as T2 “shine-through.” The T2 effects can be eliminated, with additional postprocessing, to form pure diffusion or apparent diffusion coefficient (ADC) images. Despite potential confounding influences from T2 shine-through in subacute infarcts, anisotropic DW-MR imaging reveals high sensitivity and accuracy for detection of early cerebral infarction and may exceed the sensitivity of ADC maps in the early acute phase (16). Using these techniques, cerebral ischemia or infarction has been identified in animal models as early as 15 minutes after middle cerebral artery occlusion (17, 18). Numerous authors have reported detection of focal areas of infarction at 1.5-T field strength as early as 1.5–2 hours after the onset of clinical symptoms by using both DW-MR and ADC imaging of human subjects (19–21). A 94% to 100% sensitivity for detection of acute infarction within 6 hours of symptom onset has been reported (22, 23). The changes of diffusion restriction observed on DW-MR and ADC studies after acute infarction persist for 1 to 2 weeks (19, 24, 25). The DW-MR technique has been found also to be useful for detection of small subcortical infarctions during the acute phase (26, 27). Recently, abnormalities revealed by DW-MR imaging also have been described in patients presenting clinically with transient ischemic attacks (28). In some cases, these imaging abnormalities resolved along with the clinical deficits. On rare occasions, we have observed focal diffusion abnormalities of patients without neurologic deficits after cerebral angiography. An example is given in Figure 1 of a patient who was not a member of the group that is described in this trial. These anecdotal observations, as well as the observations of Mamourian and the Doppler data described previously, resulted in a concern regarding the underdiagnosis of asymptomatic focal infarction associated with cerebral angiography. This study represents the first attempt to use DW-MR imaging to quantify the incidence of asymptomatic infarction associated with angiography. 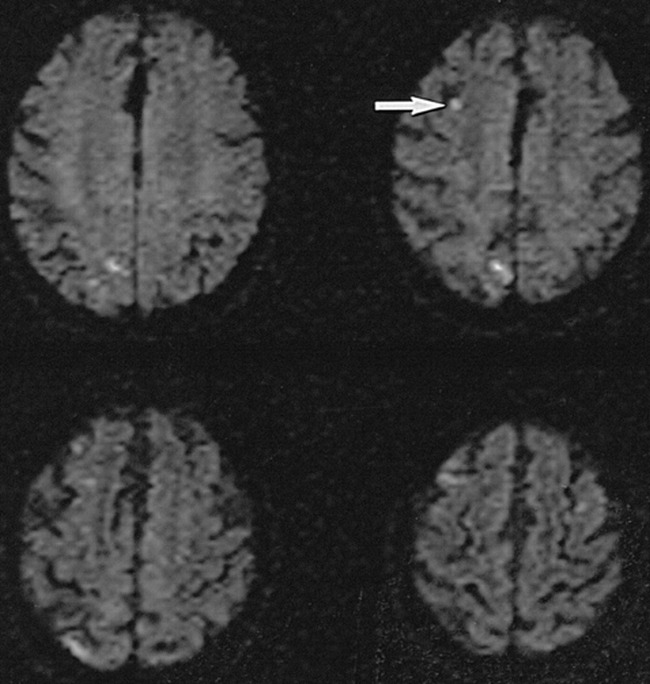 A previously published case report of a patient who developed transient global amnesia temporally associated with cerebral angiography did show changes on DW-MR images within the posterior circulation 6 hours after the procedure, supporting the use of this technique for evaluating postprocedural changes (29). The use of DW-MR imaging for the detection of infarction results in a substantial increase in sensitivity compared with that of T2-weighted MR imaging (23, 30). The high lesion C/N seen by DW-MR imaging also optimizes the visualization of small lesions compared with other MR imaging methods. Using this approach, lesions that occupy only a few pixels in the image are easily detected (Fig 1). The results of the present study are consistent with an upper bound of 9% on the rate of occurrence of abnormalities associated with angiography revealed by DW-MR imaging of asymptomatic patients. The exclusion criteria selected for the current investigation were designed to create a patient population with a low-to-moderate risk of sporadic embolization in order to minimize events that are temporally but not causally related to cerebral angiography (31). In a similar patient population, a prospective trial enrolling approximately 100 asymptomatic patients would be required to exclude abnormalities revealed by DW-MR imaging at 2% incidence (2). In patient subgroups with multiple risk factors, particularly severe atherosclerotic disease affecting the cervical vessels or the aortic arch, a higher rate of procedure-related symptomatic infarction is observed (5), and an elevated rate of asymptomatic embolic infarction might be expected also. In this trial, most patients received a small dose of intra-arterial heparin, equivalent to an infusion of approximately 600 units per hour, associated with periodic catheter flushes. This falls substantially below the 60-U/kg dose that was suggested in one publication for systemic heparinization in association with neuroangiography (32) and is not felt to have had a significant effect on the results of this trial. Five patients, however, received a bolus dose of 1500–2000 units of heparin intravenously during the procedure, in accord with our standard angiographic practice, when the catheterization was felt to be difficult or prolonged. The heparin dosing received by this subset of patients likely did result in systemic anticoagulation and could have reduced the risk of embolization in this subgroup (33). Several factors must be considered that could limit the sensitivity of this method for detecting asymptomatic ischemia or infarction. First, sensitivity for detecting very small lesions is limited by pixel size and interslice gap. Thus, it cannot be expected that abnormalities smaller than the pixel volume (approximately 30 mm3) were detected reliably in the current study. Second, lesions associated with angiography, but not occurring simultaneous to or shortly after angiography, may not be identified. Finally, transient branch occlusions, which may produce focal ischemia but do not persist or that resolve before postangiographic imaging, may not be detected. In conclusion, cerebral angiography is not associated with a high incidence of asymptomatic cerebral infarction, as determined by DW-MR imaging. The use of DW-MR imaging allows convenient noninvasive assessment of procedure-related cerebral infarction, and may be useful in the evaluation of other invasive procedures, such as carotid endarterectomy, intravascular balloon angioplasty, and carotid stenting. The following article may be of interest to the reader: Bendszus M, Koltzenburg M, Burger R, Warmuth-Metz M, Hofmann E, Solymosi L. Silent embolism in diagnostic cerebral angiography and neurointerventional procedures: a prospective study. Lancet 1999;354:1594–1597. 1 Presented at the annual meeting of the American Society of Neuroradiology, San Diego, May 1999.